pigment inks may fit through the nozzles, but... the bubble printing method requires some special property of the solvent - a particular amount of energy to vaporize it to create the bubbles . I tested it, and probably some others as well that Epson compatible inks won't print in a Canon printer, it works the other way around, I have as well used up some HP ink in Epson printers, HP is using a very similar method with their thermal printing technology. The fujifilm DL ink fades much faster on the cast coated Logicseek budget glossy paper - left patch, the right patch is printed on the Aldi/Netbit PE paper, the paper makes a big difference, if fading is your concern use a decent photo paper. Even with lamination, the range under the scotch tape left fades faster than the unprotected Netbit paper. The bottom half of the color bars got a GO overprint, the effect is slowly becoming visible on the cyan patch and just barely measurable for magenta and yellow, those will need some more weeks of exposure. The GO overprint changes the look of the printout - somehow glassier - as if behind glass - against reflecting light but no change under normal viewing light, the overall gamut is not changed. Do you advise covering your prints some sort of spray or laminate them ?? I'm not sure to see which printer you are currently using, which inks, which papers. I'm not using sprays, but I know that companies for printing supplies are offering them as 'UV guard' or scratch guard or similar, they are typically available as glossy or matte, and I'm not actively using lamination which is available as well with various options - glossy , thickness of the film, hot/cold . But my quick test with the scotch tape shows about the impact of that method. I mainly would use it for protection against splashes, humidity etc. 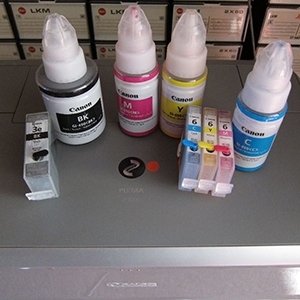 Some Epson and Canon pigment ink printers come with a Gloss/Chroma optimizer, a kind of varnish which can be applied optionally directly with the printer during the printing process. I'm testing this experimentally with dye inks, whether the fading impoves and whether the look changes. I am using a Canon ip8750 and ink from octoinkjet. I am using canon glossy paper and ilford smooth glossy 290 gsm. It is dye ink so any advice to stop fading would be appreciated. You’ll never be able to stop fading regardless of which dye ink you use, your only hope is to reduce the fading by taking some precautions, the best way is to find a paper that works with your particular ink, the paper surface can cause the biggest damage, so it’s not only the inks fault. The other alternative is pigment inks, then you’d be cooking with gas..
Several forum members did extensive searches for a Canon refill dye ink with the least fading, without much success, the genuine Canon inks are the best, by far the best in this respect, pigment inks would give you even better performance but you won't be able to switch to pigment inks with your printer model as I understand the situation. There is a Fotonic XG ink by Lyson/Marrutt, available as well for Canon which can be mentioned with reservation, it performs somewhat better than other refill inks, but you would need separate icm color profiles made for your ink/paper combinations. So you are left with the choices already addressed - you are already using a suitable paper. A spray would give you some benefit, I would guess they are all about the same , it's a matter of handling to get a uniform coating. You may give it a try and report back here about your findings, others are interested as well since you are not the first one asking for experience with those protective sprays. I was thinking of trying permafix UV spray i was told it was good at preventing UV damage. i was told it was good at preventing UV damage.